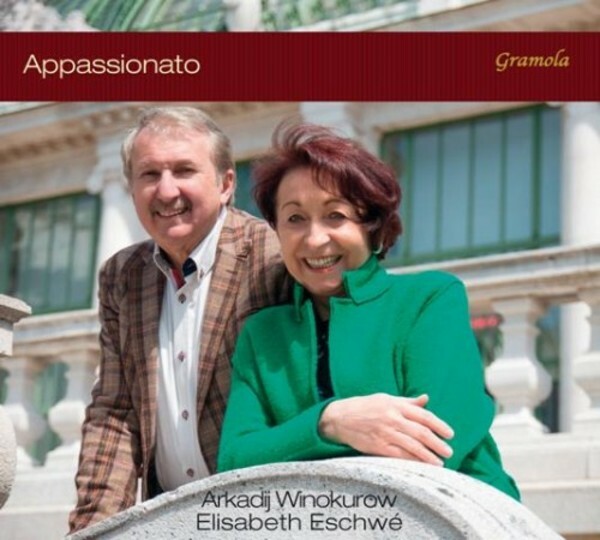 Ukraine-born violinist Arkadij Winokurow and pianist Elisabeth Eschwé, duo partners for many years, invite the audience to 'A Journey of Passion through Europe and Time'. With their new album titled 'Appassionato', they present melodies and pieces about love and affection by Clara Schumann, Edvard Grieg, Pablo de Sarasate, Edward Elgar, Karol Szymanowski, Fritz Kreisler and Maurice Ravel. As life is not always happy-go-lucky, ill-fated love, sorrow and despair can be experienced with this new CD-release through works by Sergei Prokofiev, Josef Suk, Jenö Takács or Myroslav Skoryk, proving that there are always two sides to one coin.